Food and water are essential for every living creature in this world, yet the numbers of people not having access to clean drinking water are shocking. Even 780 Million people around the world don’t have access to clean drinking water, which means around 11% of the world’s population. This is the main reason why millions of people are sick due to drinking contaminated water. According to the CDC, unsafe drinking water and lack of access to sanitation in third world countries contribute to 88% of deaths due to diarrheal diseases. In fact, LifeStraw claims that diarrhea kills more young children than AIDS, malaria, and measles combined. This situation is tragic, but will be changed thanks to a new invention. 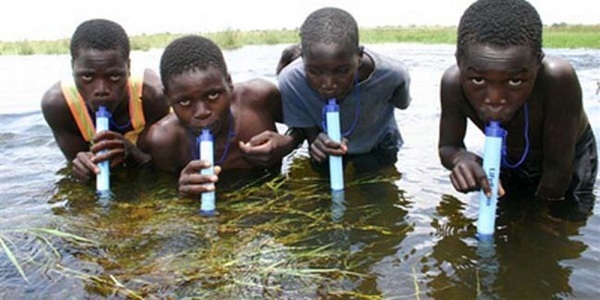 Originally developed by Danish manufacturers in 2005, the LifeStraw has been revised and refined to such a point now, that the company is eager to get their product across the world, notably in Africa, where people are in desperate need of it. The LifeStraw is a 22 cm-long purification pipe that can remove 99,9999 percent of waterborne bacteria plus other parasites, including salmonella, E-coli, campylobacter, vibrio cholerae, psuedomonas aeruginosa, and shigella. This extraordinary straw is capable of filtering at least 1,000 liters of water and is incredibly simple to use. For people living in countries where clean water is inaccessible, the invention is life changing. Since this tool can save lives, it was named the Best Invention in 2005 by Time Magazine, and invention of the Century by Gizmag. It was also labeled as ‘one of the ten things that will change the way we live’ by Forbes Magazine. In addition to the LifeStraw, the company also offers different versions of water purifiers, one of which is the LifeStraw Family. The LifeStraw Family can filter up to 18,000 liters of water, which would provide a family of five with clean drinking water for three years. The video below demonstrates LifeStraw’s capabilities. While most people wouldn’t dare to drink water from the toilet, you should know that it is actually safe to use it in such a location. This shows just how marvelous this invention is.